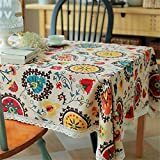 Superwinger Vintage Lace Sun Flower Tablecloth,Linen Embroidered Rectangle Washable Dinner Picnic Table Cloth,Assorted Size. This is natural cotton texture fabric,soft,stain-resistant and wear-resistant. Vitage and elegant,great idea to decorate your table. Both hand washing and machine washing are avaible. This is natural cotton texture fabric, soft, stain-resistant and Wear-resistant. It will not stick your skin when having dinner, not hot and humid, breathable. Vitage and elegant, great idea to decorate your table. Suitable for dinner table, coffee table, book desk, storage table, etc, indoor, or picnic outdoor. 1. Made of cotton linen fabrics, both of hand-washing and machine washing are avaiable. Don’t dewatering, we recomment hand wash, air dry, medium temperature ironing. 2. The dark fabric, wash into the water in the first time, there will be a little bleaching. Recommends that you add a little salt in cold water for 15 minutes before washing, wash with salt water can have solid-color effect.